A subsidiary of Mon group, MLS operates depots in Laem Chabang and in Lad Krabang. MLS specializes in providing services for empty container storage, dispatching/returning, repairing, and trucking services. The depots each measures more than 80,000 sq.m., each with a capacity to store 7,500 TEU. MLS caters to some of the most renowned global carriers and offers world class operational standards. 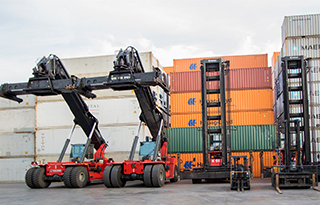 Safety standards are maintained using appropriate side-stackers for container movements and traffic control measures are implemented to reduce the risk of accidents in the yard. Additionally MLS offers reefer equipment storage facilities with more than 50 charging stations offering clients pre-cooling of reefer containers and PTI operations. With its proprietary container depot management system, MLS can systematically manage the depot's activities i.e. gate movement, inventory, and maintenance and repair status of containers. Booking management tracking container storage status vs booking volume.